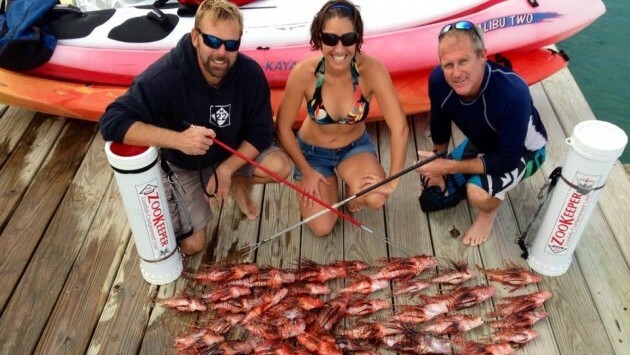 Alex Chequer, Gretchen Goodbody-Gringley and Graham Maddocks display their haul of 58 lionfish removed from a 25-minute dive to 209 feet deep. Alex Chequer, part of the Technical Diving Team, captures a lionfish at depth and puts it in a specialized containment unit. 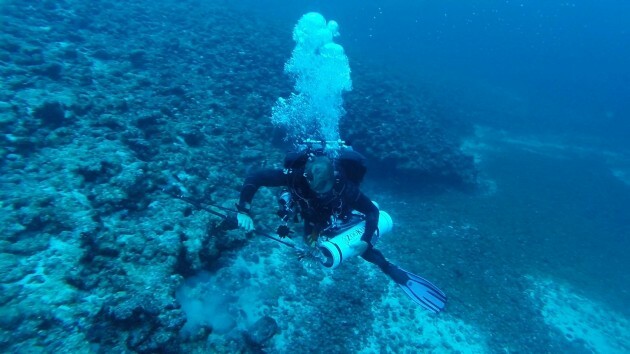 Chris Flook, BIOS small boats & dock supervisor, and Gretchen Goodbody-Gringley, BIOS coral reef scientist, both sit on the Board of Directors of the Ocean Support Foundation, and Goodbody-Gringley also serves as a rebreather deep diver on the Technical Diving Team. For more information about the Ocean Support Foundation please visit their website or visit their Facebook page.